The fourth annual National Beard and Moustache Championships® took place on Saturday, September 7, 2013 in New Orleans, Louisiana at the world-famous House of Blues in the French Quarter. Jeff Langum from Philadelphia was the crowd favorite, winning $1000 courtesy of Blue Beards Original. Langum also won gold in the most competitive category, full beard natural. The contestants and their fans paraded up Bourbon Street to the music of an authentic New Orleans second-line band to kick off the event. The National Championships utilized an eighteen-category system based on the system commonly employed at the World Beard and Moustache Championships. 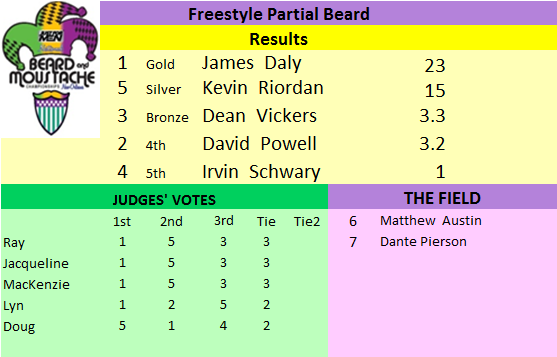 The categories ranged from the delicate Dali moustache to the anything-goes full beard freestyle. The championships were and are open to anyone, regardless of nationality, experience, or club affiliation.